Thandi Sibisi opens eyes to a new crop of South African artists. 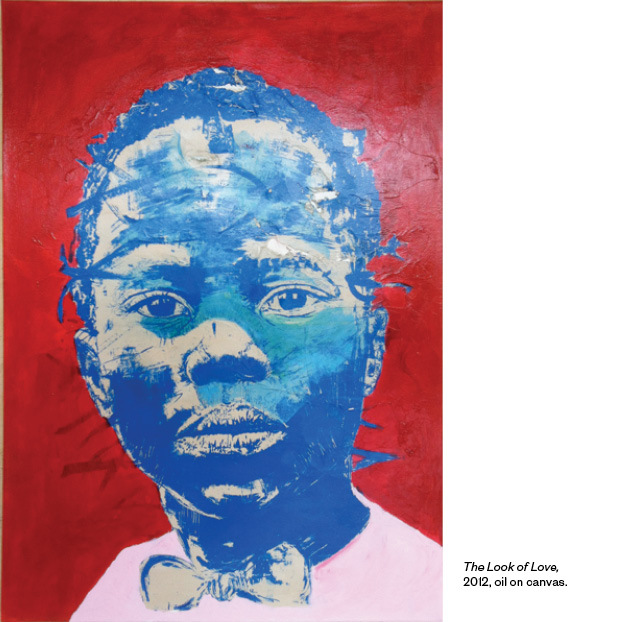 Sibisi got her start as a consultant for the Johannesburg Department of Arts and Culture, working closely with dealers and becoming well acquainted with the South African art scene. It was during this time that she recognized a severe lack of diversity within the market. “Because the industry has been closed off to so many people for so long, they’re not able to sell artwork. Honestly, there is no way such a small group of consumers can support the entire art industry,” says Sibisi. She saw opening a space as an opportunity showcase underrepresented up and coming and established African artists side by side. “A lot of people were like, Who the heck is this 25-year-old thinking she can open this gallery when it’s never been done before?” she says. “But I just went and did it.” In the gallery’s first year, Sibisi has exhibited a number of artists like painter Nelson Makamo of Limpopo, photographer Justin Dingwall of Johannesburg and painter Esther Mahlangu from Mpumalanga, attracting patrons from Europe and abroad but also creating interest where it’s needed most: right at home in South Africa. Ester Mahlangu began painting at the age of 10, learning from her mother and grandmother. 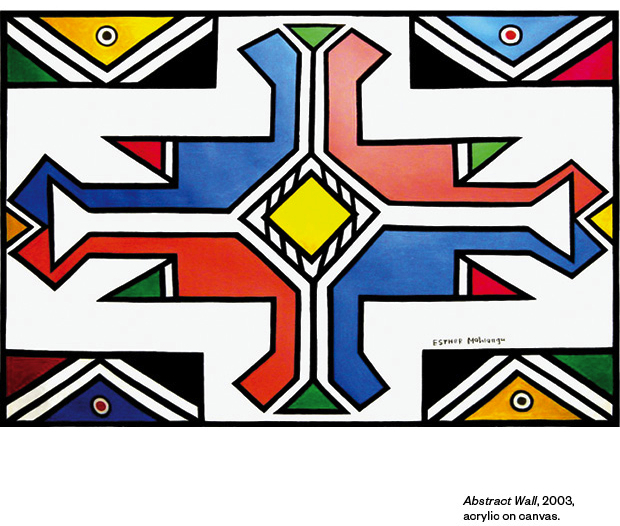 Mahlangu’s work continues in the Ndebele tribal tradition of brightly-colored abstract mural paintings, which are made exclusively by women. Her work has been displayed in the Guggenheim Museum Bilbao in Spain and at the Lyon Biennal in France. In 2010, she was commissioned by BMW to paint a BMW 525i for their Art Car series at the Museum of Art and Design in New York. Justin Dingwall is a Johannesburg-based photographer. 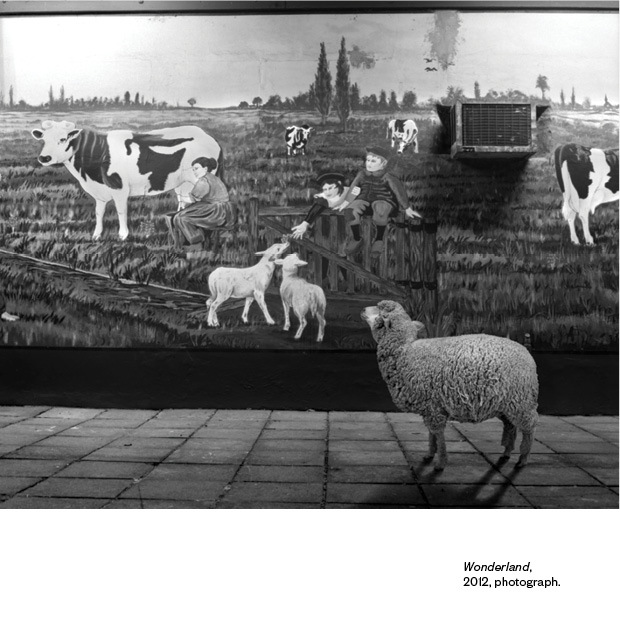 His “Incurious” series, from which this photo is taken, uses sheep to explore man and his relationship to animals as “other.” His photography has been featured in GQ South Africa and Home, a South African domestic interiors magazine. Nelson Makamo is one of the best-selling artists at the gallery. Born in the city of Nylstroom in Limpopo, the northernmost province of South Africa, and now based in Johannesburg, he works primarily in portraiture and figurative abstraction. His work is included in the private collections of designer Giorgio Armani and singer Annie Lennox.